Martin Luther 10 November 1483 18 February 1546 Roman, German Hans Luther Alberta Williams King Physician, Writer, Theologian, Professor, Priest, Monk A German monk, theologian, university professor, priest and church reformer, most popularly known as the Father of Protestantism. 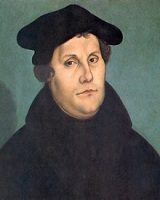 Luther was the one, who began the Protestant Reformation and changed the course of Western civilization. A list of popular martin luther quotes are given below.